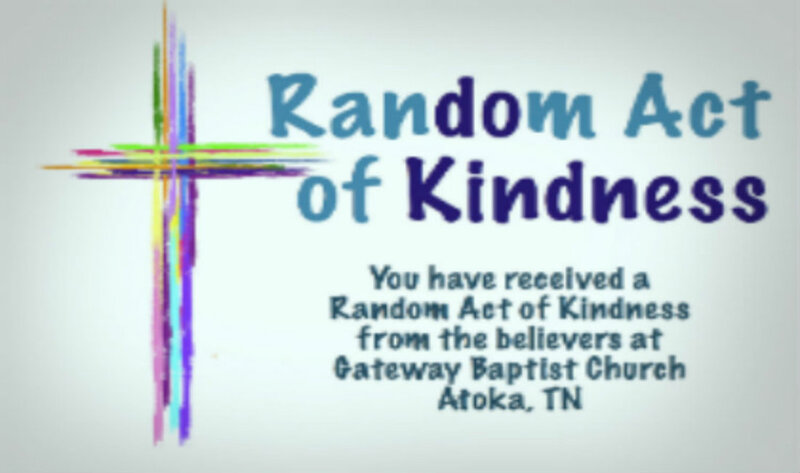 Pick up an idea sheet and “kindness card” at the connection center or at the back of the worship center. Choose the acts of kindness that you will perform or come up with random acts of your own. A few of the ideas will take a little preparation. On Saturday, October 12, do as many random acts of kindness as time allows and pass out your cards to the recipients. (Pictures and brief video of your efforts would be appreciated so we can celebrate the smiles!) Be sure to pray for God’s presence and leadership before you go! There will be some training and ideas shared at Gateway Family Sunday night as we talk about creatively sharing our faith. Let’s do this together and leave our community wondering what just happened!